From Silicon Valley leader Maynard Webb, Rebooting Work shows how we can leverage technology to change how we work. The book also reveals how anyone can take control of his or her own future, finding greater fulfillment, productivity, and happiness. Who Is the CEO of Your Destiny? In his first book, Rebooting Work, Silicon Valley veteran Maynard Webb offers an engaging reassessment of the new world of work built on a four-frame depiction of worker archetypes: Company Man or Woman, CEO of Your Destiny, Disenchanted Employee and Aspiring Entrepreneur. He then argues convincingly that the only true path to success lies in Frame 2, CEO of Your Destiny. Frame 1, the Company Man or Woman, refers to people who are high achievers with great attitudes, but who frame their careers in terms of a company. This is the old-style path to success, but today it is a dangerous path, as the paternalistic company that rose out of the industrial revolution — the company that looked upon its employees as (almost) children who needed to be taken care of — no longer exists. Job security is a thing of the past, and no matter how fancy your title you can still find yourself on the street one day. The second archetype is the CEO of Your Own Destiny, which describes people who take full responsibility for the success of their careers. These highly successful, high-performing people see themselves as entrepreneurs and are always looking to build networks. Frames 1 and 2 are the top two boxes of Webb’s four-frame framework. Then there are the two frames "below the line" — the more negative sides of the Company Man or Woman and the CEO of Your Own Destiny. The Disenchanted Employee is the unsuccessful face of the Company Man or Woman. Those in this frame place complete responsibility for their success on the company and are unhappy that no one has yet "discovered" their talent and value. The flip side of the entrepreneurial CEO of Your Own Destiny is the Aspiring Entrepreneur, those who recognize the need to take charge of their careers but have been unable to successfully launch independent businesses. These people have the right attitude but have yet to make it happen. The four frames are work attributes, Webb writes, and not necessarily personality attributes. In other words, most of us move through the different frames throughout our careers. Someone might be a happy company person for a few years, and then his career stalls and he stumbles from Frame 1 to Frame 3. Eventually, that person ceases to search for another paternalistic company and instead moves to the Aspiring Entrepreneur frame. Webb and co-author Carlye Adler devote an equal amount of page space to the four frames, but they leave little doubt that all roads lead to Frame 2. This doesn’t mean that you can’t be in a company for many years; it means that even as a longtime employee or manager of a company, you continue to recognize that the responsibility for your success is yours, not the company’s. Webb is the former COO of eBay and has been a board member or executive with a number of Silicon Valley companies. Webb and Adler bring a balanced perspective to their view of the modern workplace. There is no disdain for the Company Man or Woman attitude, just a gentle warning that today you are more likely to be successful if you think of yourself as the architect of your own destiny. 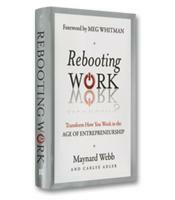 Rebooting Work is one of the best and clearest examinations of the workplace on the shelves today.